The Paurn Village Based Preschool situated in Trapeang Sala Khang Keut Commune, Banteay Meas District, Kampot Province, in Southern in Cambodia has been implemented by the CCAFO in collaboration with the District Office of Education, Youth and Sports. The initial set up fund was provided by the Queens' / Clare Overseas Education Fund, the Boeing Company, Rotary Clubs of Maple Valley U.S.A and CCAFO friends in the U.K. The school serves children aged three to five years, who have been living, or have recently moved to the village. Furthermore, we have assisted parents of the students participating in this preschool in the academic year, to enroll in grade 1 at the state schools in order to continue their academic development. The St.Patricks Day 3 Legged Charity Race (one time annual funding [running cost]). Sony was chosen to be the teacher based on introduction of the village committee. She was the high school students prior to join CCAFO. 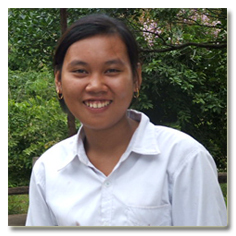 Sony joined the two week in-house training to become the village based preschool teacher. The Preschool Unit Supervisor Mrs. Yeung Sarang trained and has been conducted the monitoring and provide additional training to Sony. Statistic record since the school open in the school year 2006-2007 to 2017-2018: 271 students (158 girls). As of November 12, 2018, the number of students for School Year 2018-2019, is 18 students (9 girls).